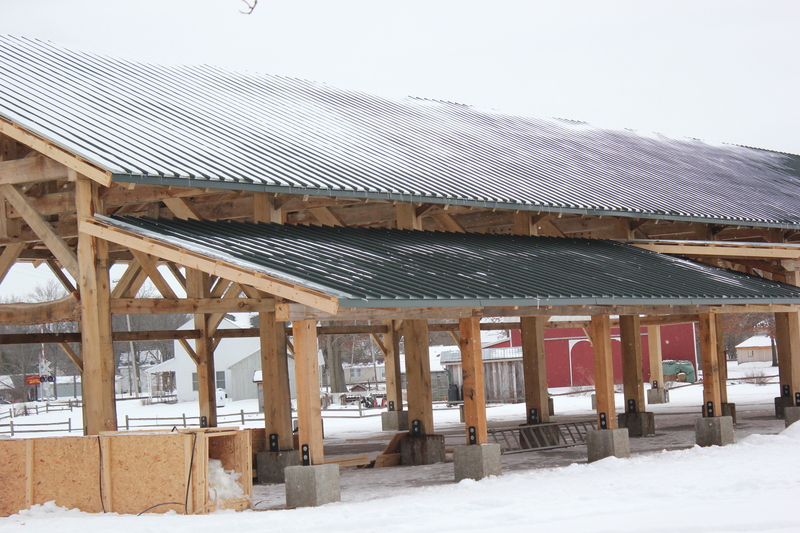 Work on the Community Pavilion is nearly finished with the standing-seam metal roofing being put in place. The original plan had the roofing materials and electrical installations finished sometime around Thanksgiving. All other work was finished but the heavy-duty steel material was late in arriving due to manufacturing difficulties. Now the roofers are working in between snow storms and cold weather to get the attractive and functional roof in place. Once the roof is on the building, the final chore will be for Dan Oswalt of Oswalt Electric, to finish installing the electrical service from the base of the posts to the ceiling and installing the light fixtures. The electrical design was based on the needs for general use and the specific needs of both the Lions Club for their Summer Festival and the Vicksburg Farmers’ Market. Once the wiring is finished and the light fixtures have been put in place, the Vicksburg Community Pavilion will be ready for users in the spring. One final piece of business is to raise the last $15,000 needed to complete the work. So many people have made contributions to the project since it began over two years ago. By an actual count, over 700 individuals, families and businesses from all over the U.S., Canada, Europe, South America and Australia have played a part in constructing the pavilion this far with both cash and in-kind donations. The Vicksburg Foundation supported in the amount of $163,000, the Kalamazoo Community Foundation for $10,000 and individual donations totaling $97,000. Additional donations of materials, consultations and services totaling an estimated $100,000 have been critical to bring this outstanding project so close to the finale. Representatives from Portland, MI visit the Vicksburg pavilion construction site in January to learn all about building a similar structure in their community from Kristina Powers Aubry. Now, the Historical Society hopes area citizens will take up the challenge to ‘Finish the Pavilion.’ “Every donation we receive will bring us closer to raising every last cent we need to do it right,” said Bob Smith, new president of the Vicksburg Historical Society. “We hope that everyone who hears of the need for the last few dollars will look at it as an opportunity to put their name in the history of this outstanding project.” For information on benefits of donations of more than $500, contact the Historical Society at 649-1733. 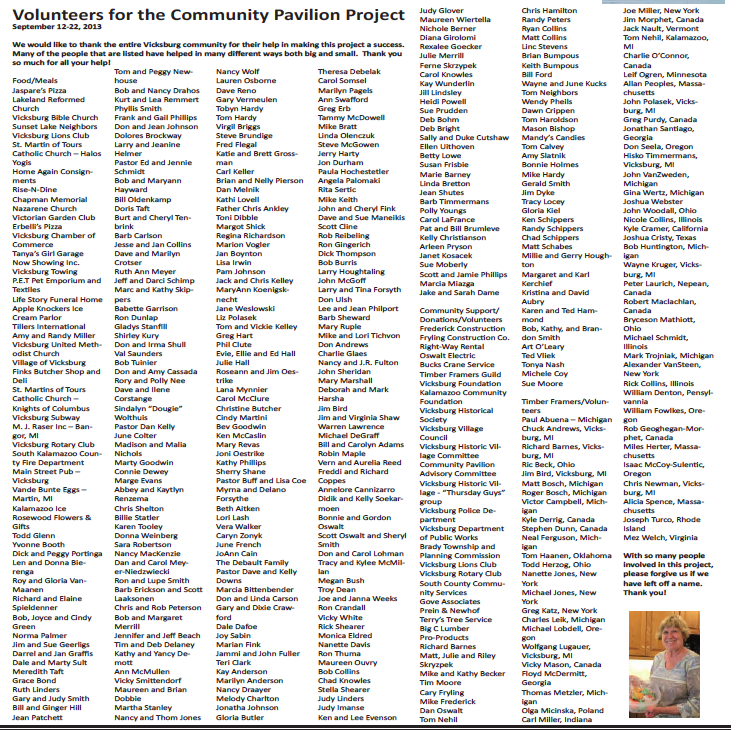 Tax-deductible contributions should be marked Pavilion Project and sent to: The Pavilion Project, Vicksburg Historical Society, 300 North Richardson Street, Vicksburg MI 49097. The Vicksburg Historical Society is a 501(c)(3) non-profit organization. With the last bit of help the Vicksburg Community Pavilion will be ready to be the site of many grand events as soon as the weather breaks, Smith reinterated. 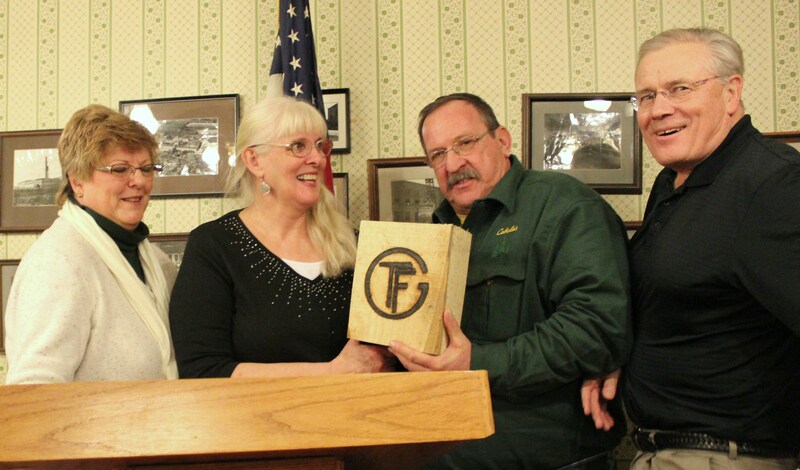 Left: Kristine Powers Aubry, Margaret Kerchief, Ken Schippers, and Bill Adams display the block of wood as the keys to the newly built pavilion at the Historic Village. The symbolic handing over of the keys to the new pavilion by the Historical Society leadership took place at the last December meeting of the Vicksburg Village Council. Having no keys to give since the structure has no doors, Margaret Kerchief and Kristina Powers Aubry, president and vice-president respectively, handed over a block of wood to Ken Schippers, acting village manager. The two representatives of the Historical Society were leaving their posts as officers at the end of December and wanted to tie up loose ends of their two years of work on the pavilion and other projects. It has been the norm in the past for any building constructed in the Historic Village to be given over to Village ownership, once it has been completed, as the park is Village property. A unique arrangement between the Village, the Historical Society and the Historic Village was worked out in 2007 where the buildings’ interiors are the Society’s responsibility, but the land and the exterior of the buildings are owned and cared for by the Village of Vicksburg. Thus, the ceremonial keys to the pavilion were handed over. Nevertheless, Powers Aubry and Kerchief cited the work that still needs to be accomplished for the spring opening of the Farmers’ Market. The steel roof, the electrical finishing work, and future construction of bathrooms will be needed to complete the project. Additional funds will be needed but the Council accepted the symbolic keys with the caveat that the Historical Society would continue to raise money and complete the construction through Frederick Construction Company which has donated time and talents to coordinate the project. Powers Aubry also gave an update on the Historic Village Committee’s strategic plan, which was finalized in December, so that she could feel that her work was done. She has been the long-serving chair of this committee that is appointed by the Village Council and answerable to it via yearly reports. The plan includes other buildings that might be built in the Historic Village. A general store is envisioned with a sweet shop, such as Doris-Lee’s used to be. Much of their equipment was donated to the Historical Society a few years ago. A small chapel to go with the gazebo already on the property would follow so that weddings could be performed in an enclosed place. Other buildings in the dreaming stages are an opera house, a granary, spring house, and a mint. Squinting against the bright September sky, project foreman Rick Collins surveyed the scene before him. Something extraordinary was about to happen in the small town of Vicksburg. “I would go so far as to say that it’s probably been well over one hundred years since anyone has built a structure this way,” he declared. The 120-by-46-by-24 foot post-and-beam construction would take 70 timber framers and 2900 board feet to build…plus about 3500 paper plates (recyclable). More specifically: carpenters and apprentices from 20 US states, Canada, France, England and Poland; white ash, oak, black locust, poplar, and cherry donated from local landowners; and paper plates full of homemade food prepared by 330 members of the local community. All that after two years of dreaming, planning, and the fundraising necessary for the vision to be realized: a pavilion where the farmer’s market, summer festivals, and special events of Vicksburg, Michigan, would have their home for the next few centuries. Assuming certain minor details could be worked out. “Did you pick this portapotty spot? …because if you did, I’m going to start doubting your management skills. I’m about to pick another one.” The very no-nonsense Alicia Spence didn’t wait for the local historical society hosts to answer, but delegated the relocation of the mobile relief stations without breaking stride. Spence, project manager extraordinaire of the Timber Framers Guild, knows what it takes to deliver a project of this magnitude efficiently. That’s why she’s in charge—the HMFWIC, as it were. For the uninitiated, that’s “head-mother-bleeper-whut’s-in-charge,” to quote the English-accented carpenter who put it that way. Laughter followed from his mostly-American colleagues in “Braceland,” the tent where the group was busy building braces. Apparently, the HMFWIC is a universally understood referent. This kind of work isn’t for the faint of heart. Every gritty, safety-goggled worker bent over a tool was putting his or her whole heart and soul into the endeavor. Richard Barnes, who owns a saw mill south of town, turned the logs to timbers, then he joined dozens of volunteers from the TFG and local community who put in long days on the construction. 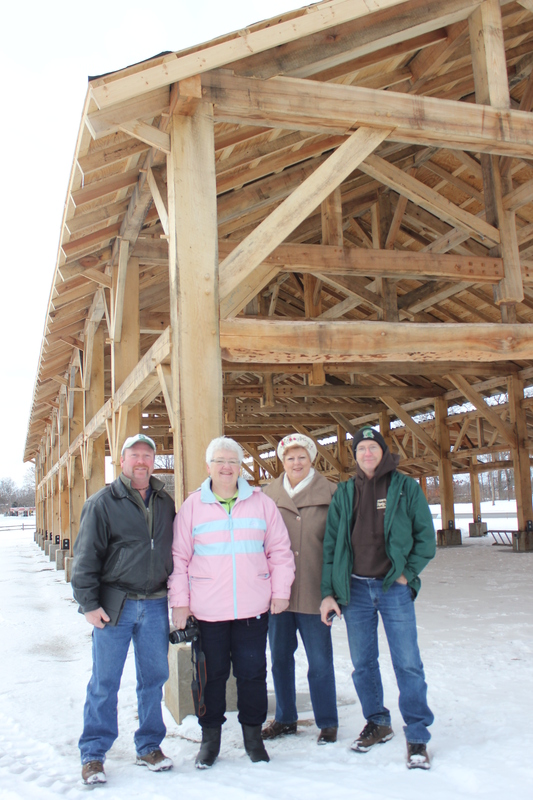 For many, it was their first timber framing experience. Some were getting a good dose of OJT from TFG instructors. Others were the kind of woodworkers who just might be using some of their grandfather’s tools as well as an iPhone FingerCAD app. It’s that reverence for old world ways combined with new age technology that is the hallmark of timber framing today. The wood has been sealed. The concrete pad will be sealed as soon as the weather cooperates. The roofing materials have been ordered and construction will take place in November. Donations are still being sought to pay for the finishing work by the Pavilion Advisory committee. With so many workers coming from faraway places, the question of room and board had to be answered. A tent city was put up beside the community garden next to the worksite for anyone preferring a camping experience. Others were welcomed into homes around town. The Nazarene Church was available for showers. It was one of many churches that provided hot meals. So did organizations like the local garden club. Member Martha Stanley dubbed her peanut butter oatmeal chocolate chippers Lumberjack Cookies in honor of occasion. As the workers came through the line in the dining tent, she’d ask each one where they were from and visit with them. “They were so friendly and thankful for the food. That made me feel full,” Martha said. Members of the community and local businesses volunteered countless hours to ensure that three squares a day were ready for the crew. The Rise-N-Dine, Subway, Main Street Grill, Apple Knockers Ice Cream Parlor, Erbelli’s, and Jaspare’s Pizza all donated meals, complementing the homemade fare from local churches, groups, clubs, even designated neighborhoods. Karen Hammond of the Vicksburg Historical Society managed the herculean task of coordinating meal donations and the business end of things in the dining tent. Not a day went by that someone who hadn’t even signed up for food duty would drop by with something to keep the snack table stocked. Hammond says she loved every minute of it.